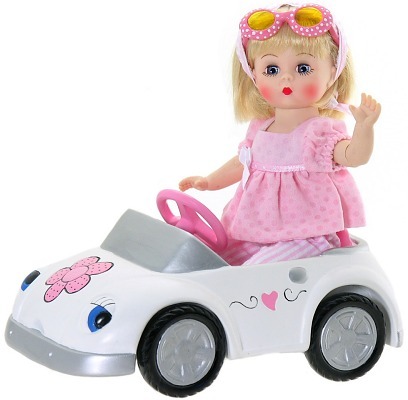 8" Wendy Learns To Drive is at the wheel of her own white sports car with silver wheels, a pink flower on the hood, pink hearts on the doors and a license plate that says "Wendy". Her driving outfit is a pink on pink polka dotted blouse trimmed with a white polka dotted satin ribbon and a white satin bow that is worn with pink and white candy striped Capri pants. A matching scarf covers her blonde hair and polka dot sunglasses protect her blue eyes. Retired item - available for limited time.